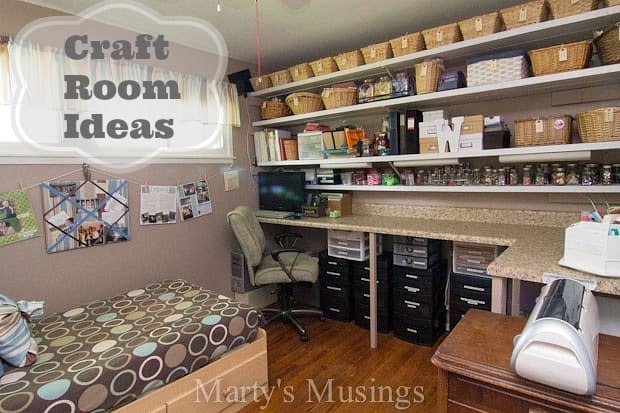 Marty, from Marty’s Musings, turned one of her bedrooms into her dream craft room. She tried to create her craft room in a small space for little money! Marty shows how she stores her massive scrapbook papers and ribbon collection, and how she used dollar store baskets and open shelving for storage. Check out her entire room HERE. Thanks for including my room, Tracy! I’m actually reorganizing it again! I’ll be sure to submit the redo when it’s done! Yeah! I can’t wait to see it! !